Adebayo Shittu, minister of communications, has described himself as incorruptible, saying President Muhammadu Buhari is his mentor. In an interview with Tribune , Shittu denied all the allegations levelled against him by Victor Oluwadamilare, his former spokesman. In a strongly-worded letter which went viral on Thursday, Oluwadamilare accused Shittu of being corrupt. He said despite living in flambuoyance, the minister refused to pay the emoluments of some of his aides. Oluwadamilare said Shittu’s “inhumanity” almost ruined his life, vowing to ensure he recovers the debt the minister is allegedly owing him. But the minister said Oluwadamilare was acting the script of those bent on destroying him politically. 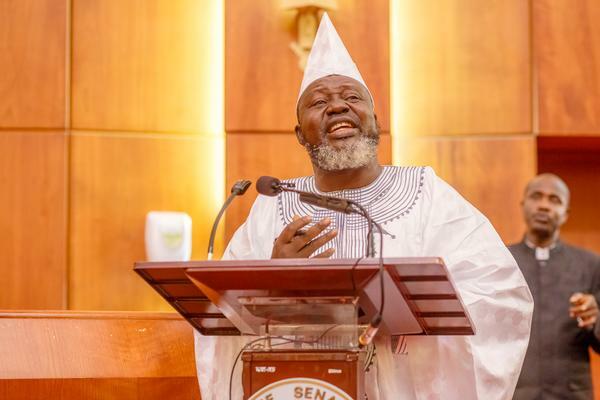 He said he employed his former aide out of “humanitarian consideration”, disclosing that of all those who showed interest in being his spokesman, Oluwadamilare was the only Christian. “I thought that I could use the appointment I gave him to rehabilitate him. More so, at the time I appointed him, of all those who applied as media aide, he was the only Christian. I didn’t want a situation where all my aides would be Muslims, so I decided to appoint him. And I thought the appointment would rehabilitate him because I knew he was jobless at that time,” he said. “He is being used by my political enemies, all of whom, by the grace of God, will fail. “I am a moralist, I am incorruptible and I try to take after my leader, my mentor, President Muhammadu Buhari and I do not do anything that I cannot justify. I go on economy class whenever I am flying, whether within or outside the country. “So, I don’t know what type of luxury life he claims I am living. A lot of people will take pictures with me in the economy class and they do pray for me. There is this adage that you give a dog a bad name in order to hang it. Because they have a target, they want to stop me, but I will not allow them to succeed. Shittu also denied the allegation that he had acquired 12 houses and 25 luxury cars in the last three years. He said the only house he has in Abuja through a loan he obtained from Jaiz Bank and that two influential personalities in Oyo state donated two cars to him. “I want to put you on notice that I am taking him to court over all these allegations to justify himself. In law, he who asserts must prove. If he is accusing me of having houses in Lagos, Abuja and Ibadan, he should have the courage to state the locations. I will not assist him in his job. He has the herculean task of proving that in the court. I can give you the list of the houses that I have. I don’t have any house in Lagos. I have one house in Abuja, which I bought on mortgage from Jaiz Bank. I have two houses in Ibadan. So, those extra houses in Lagos, Abuja and Ibadan, he will have to justify them in court. “Where will I, Adebayo Shittu, with my anti-corruption posture, with my very modest lifestyle all through and with my religious inclination, get the money for all of those vehicles? Does it make sense that somebody with socialist orientation will have that number of vehicles? Since I came on board as minister, two people donated two cars to me. Seyi Makinde donated one of the jeeps that I have and a former Accountant General of the Federation, Mr Jonah Otunla, donated one and I bought one for myself. So, Victor Oluwadamilare will have to explain where the other vehicles are.